This holiday season, more than 25,000 children will wake up in NYC homeless shelters. While losing one’s home is difficult for anyone, it is devastating for a child – who must cope with the loss of friends, familiar surroundings and prized possessions. By donating a brand new gift for a homeless girl or boy, you can help make the holidays just a little bit brighter for those who need it most! Congratulations to First Step Classes 124 and 125! 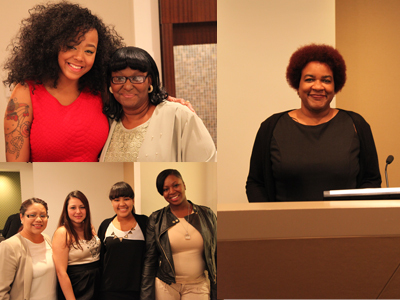 On Wednesday, November 5th, family, friends and staff gathered at the offices of Hughes Hubbard and Reed, LLP, to celebrate the 33 remarkable women who successfully completed the First Step Job Training Program. The women of classes 124 and 125 spent 14 weeks learning new skills, working at internships, forming lasting friendships and – as many of the graduates enthusiastically and sometimes tearfully reported while accepting their diplomas – greatly increasing their self-confidence. One of the most inspiring moments of the evening was the speech from graduate Cherise McCrimmon (pictured, far right). Good evening, fellow graduates of First Step Classes 124 and 125, family and guests, and staff of First Step. It is an honor for me to stand here before you today. My decision to come to First Step was one of the best and most difficult decisions I have ever made. After being laid-off for a few years, having two major surgeries, and finishing six years of therapy, I was very lost and scared. I just did not know what to do or where to turn. I had dealt with the Coalition for the Homeless many times in the past when I was homeless and then when I ran into trouble with my rent. I knew about First Step, but was skeptical because I had been through a number of so-called “job training programs.” None of them worked, and the people who ran them did not care if you were there or not. There was no job training – just sitting there all day waiting for a MetroCard. It was seriously time to change my tactics and my attitude. When my class started, I think we were all a little skeptical about First Step, the staff, each other and ourselves. What would be different? What would change? Well, everything changed from the minute we walked in the door. This was­ nothing like the few job training programs I had been in before. Here at First Step, we all had someone to watch over us and keep track of us. We had self-esteem workshops, interview workshops, guest lecturers, trips to yoga and Estee Lauder. But we also received real computer and job training classes. We each had our own mentors, which was incredible. We gained real job experiences through our internships – like a real college internships, if not better. We were respected. The people at our internships were wonderful, kind and helpful people who gave great advice. But we also got more than we expected, like real bonding and friendships between the ladies. There was no cattiness that people expect when there is a large group of women together. We cried together, prayed together and even got angry together. Most of all, we found out that we all had similar experiences and heartbreaks. That is what made us closer. When the ladies in our class started letting the walls down between us, we found that we are smart, articulate, courageous and beautiful. Even though we were scared through most of our lives, we stood strong for our children and families and what we believed in. We let go of the past so we could embrace the future. I think my biggest surprise was when [First Step Director] Liz left a message on my phone one day. My class was in the third and final phase of First Step; Liz asked me if I wanted the post-internship job at First Step as a Computer Assistant. I was stunned and honored – it was an amazing feeling. Now I get to pay it forward and help some of my other sisters make it. I wish to thank all the staff at First Step, Elizabeth Henderson our Director, who kept on us about being on time and made sure we remained professional even when it was hard to be professional. Anel Saldivar and Elena Loveless, our Case Managers, stayed on us about our work, but most of all they both listened to us when we were angry, sad, ready to give up or just plain wanted to vent about something. Jacqui Roberts, our Job Readiness Coordinator, made sure we really looked at what we wanted to do with our futures. She really made us look at what would make us happy in a job, not just settling for anything that comes along because we need the money. Robert Porter, our Computer Instructor, came into our class about a week or two after we started. We really tried to give him the business, but he hung in there like a champ – he would not be discouraged. We found out that he is a funny, sensitive man who really believes in what he is doing and wants to help make our futures better. Caitlin, our First Step Intern, has a wonderful smile and just lights everything up when she’s around. As a class, we went through more experiences together than we could have ever imagined. Graduation is a new start for us: We gained confidence in ourselves, we gained real job skills, and we gained real friendships. But most of all, we all started to believe this time around we can make it! No matter what path we choose to follow as we progress into our futures, we will be the best that we can be. Not only am I excited to see what lies ahead, I know that the people sitting here today and the people that support us feel the same way about us. Juan De La Cruz is the organizer for the program. He said that not everyone they serve is homeless, but that everyone they serve has a need.